Too often, I hear parents beating themselves up over children who have left the Church and idolizing parents whose children have remained faithful Catholics. Perhaps some of the blame lies with the parents. However, we must realize that Saran is maliciously at work to tear our children away from the Faith and us. He’d prefer to destroy the Family altogether. “Satan hates our children. He will rip and tear at them, trying with all his might to drag them away from us, from the Faith, and from God. He will stop at nothing to destroy every family in existence. That any of our children have gone wayward should not surprise us but rather determine us not to give up, no matter what”, I wrote in my latest post for National Catholic Register. It’s admirable to have raised children who are fervent about Catholicism. But, it’s the Daughters of Jerusalem I most admire. 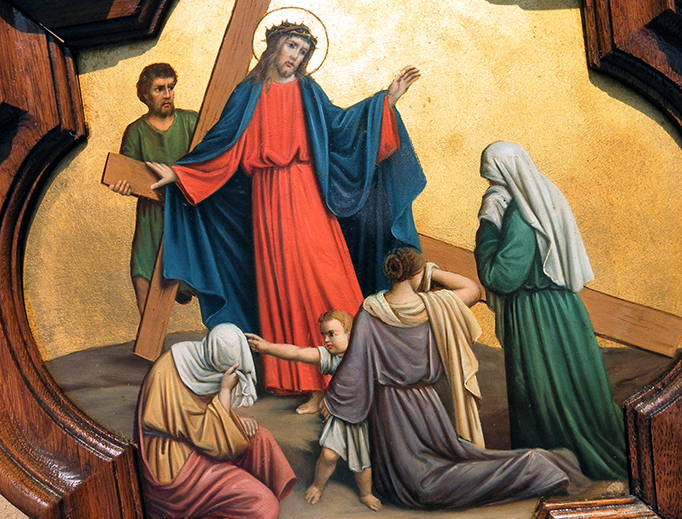 As you make your way along the Way of the Cross this Good Friday, stop to consider the weeping women and our Lord’s words to them. Catholic Church, Lent, Liturgical Year, Scripture. Bookmark.